Focused in Eye Care & Eye Wear…To Love How You Look. 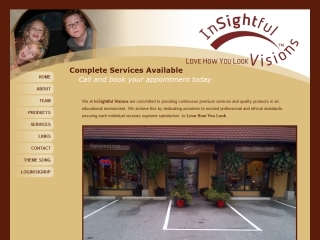 InSightful Visions Corporation was born from a vision and a dream for all that could be in the optical industry, its goal, to create an umbrella in which independent practitioners in eye care could work together in unified service. Our collective group of experienced multi-disciplinary service providers has utilized the guidelines from our professional and medical standard acts to support us in creating our own individual approach to informative care.